We’re talking about the life issues that get in the way of your success. We don’t agree with it, but you sure act like you don’t deserve to live the good life in the body of your dreams. Take a moment to think back on all the times you have self-sabotaged your weight loss efforts. If you don’t believe deep down that you are worthy then you’ll never give yourself a chance at a fit body. We believe that you deserve to have a healthy body—and we urge you to dig deep down to uncover why you don’t. Once you conquer your feelings of unworthiness, getting on an exercise and healthy eating plan will be easy. Just A Few Minutes Are you a chronic procrastinator? Do you put off going to the gym? Research shows that by spending ‘just a few minutes’ doing the dreaded task you’ll feel an urge to see it through completion. These initial few minutes of activity create an open loop that refuses to close until the job is done. 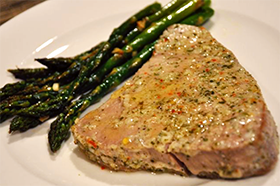 Seasoned Ahi Steak Ahi tuna is high in protein and low in fat, the perfect combination for building a lean, toned body. Add a side of roasted asparagus for a delicious healthy meal.